These Pet Rescue level 370 cheats and tips will help you beat level 370 of Pet Rescue. 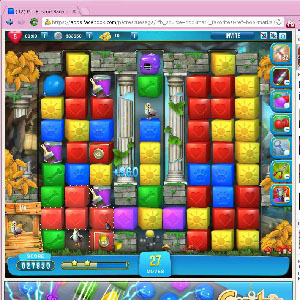 The objective of Pet Rescue level 370 is to save 4 pets and get 10,000 points in 60 moves. In order to open the carriers in Pet Rescue Saga level 370, you need to use plenty of paint cans. Very few matching blocks will enter the board. Keep the board moving and combine the effects of paint from both the left and right sides to match the carriers and bring the middle carrier down. The final carrier will not enter the board until the first three are opened. This means you need to get rid of all three carriers as quickly as you can to give yourself enough time to open the last one, too. Look for opportunities to open more than one carrier with one move by using paint to make a bridge between sides. The final pets will come down the central pipe, and they’ll encounter blocks all the way down. Sometimes those blocks can’t be simply matched out–in fact, that’ll happen most of the time. Save your balloons to deal with those blocks. If you can’t get rid of a block with paint, a balloon will do nicely for a long-range solution.